Washington: Black holes are hanging out at the centre of our galaxy by the thousands, according to scientists who have detected a bunch of them in the neighbourhood of a supermassive black hole already known to reside at the heart of the Milky Way. Researchers said data from the NASA’s orbiting Chandra X-ray Observatory allowed them to detect a dozen black holes surrounding Sagittarius A*, the mammoth black hole at the centre of our spiral-shaped galaxy. Black holes, which come in a variety of sizes, are extraordinarily dense entities with gravity so powerful that not even light can escape. Based on these findings, the scientists estimated that up to 10,000 black holes dwell within about 3 light-years of Sagittarius A*. Sagittarius A*, boasting 4 million times the mass of our sun, is located 26,000 light years from Earth. A light-year is the distance light travels in a year, 5.9 trillion miles (9.5 trillion km). “Since our galaxy is very average, it tells us that the universe is teeming with black holes orbiting near their supermassive black holes because most galaxies have supermassive black holes,” Hailey said. 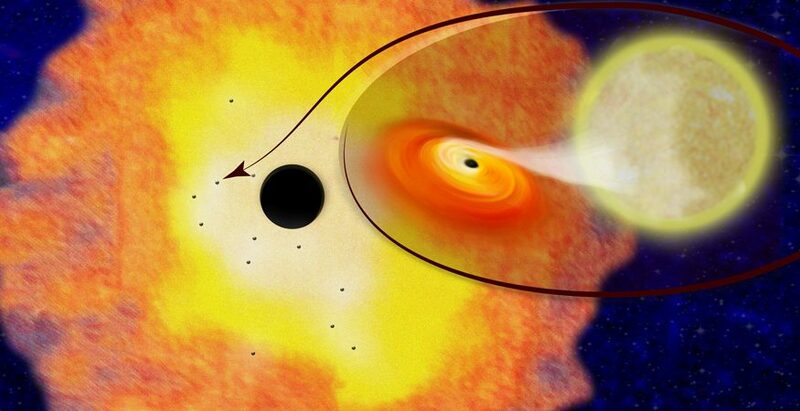 “Black holes can form farther out from the centre of the galaxy. They gravitationally interact with stars, cosmic collisions so to speak, and lose energy,” Hailey said.